Chromatophore is a pigment-containing and light-reflecting cell, found in various invertebrate and cold-blooded vertebrate animals, that can help bring about changes in color or brightness in the organism. Among animals with such cells are various crustaceans, cephalopods, amphibians, fish, and reptiles. Through aggregation or dispersion of the pigment and reorientation of reflective plates in single cells (in most animals) or through the muscular movement of complex chromatophore organs (in cephalopods), the color or brightness of the entire organism or part of the organism can change, which is useful for camouflage, signaling, temperature regulation, and protection from radiation. Mature chromatophores are grouped into subclasses based on their color (more properly, "hue") under white light: Xanthophores (yellow), erythrophores (red), iridophores (reflective/iridescent), leucophores (white), melanophores (black/brown), and cyanophores (blue). Chromatophores are largely responsible for generating skin and eye color in cold-blooded animals and are generated in the neural crest during embryonic development. In a cephalopod, like an octopus and cuttlefish, the complex chromatophore organs and neural control allow very rapid changes in colors, color patterns, and color intensity to allow the organism to blend instantaneously with the background. Unlike cold-blooded animals, mammals and birds have only one class of chromatophore-like cell type, the melanocyte. The term "chromatophore" also can refer to colored, membrane associated vesicles (organelles) found in some forms of photosynthetic bacteria. In addition to their obvious value for the animals with chromatophores, these cells are being explored for potential application for people, including modeling diseases, use in appetite suppression and tanning, and as biosensors and for rapid disease detection. These cells also add greatly to the diversity and wonder of nature for people. Invertebrate pigment-bearing cells were first described as chromoforo in an Italian science journal in 1819 (Sangiovanni 1819). The term chromatophore was adopted later as the name for pigment-bearing cells derived from the neural crest of cold-blooded vertebrates and cephalopods. The word itself comes from the Greek words khrōma (χρωμα) meaning "color," and phoros (φορος) meaning "bearing." In contrast, the word chromatocyte (cyte or κυτε being Greek for "cell") was adopted for the cells responsible for color found in birds and mammals. Only one such cell type, the melanocyte, has been identified in these animals. Warm-blooded animals are not considered to have classical active dermal pigment cells (chromatophore)s in their integument (Oliphant et al. 1992). However, bright colored dermal pigment cells are found in the irides of many birds and are comparable to the chromatophores of lower vertebrates (Oliphant et al. 1992). While mammals appear to have lost the potential to produce iridophores, erythrophores, and xanthophores comparable to lower vertebrates, Oliphant et al. (1992) suggest that their remains a potential presence of classical chromatophores in mammals. Some species can rapidly change color through mechanisms that translocate pigment and reorient reflective plates within chromatophores. This process, often used as a type of camouflage, is called physiological color change. Cephalopods such as octopus have complex chromatophore organs controlled by muscles to achieve this, while vertebrates such as chameleons generate a similar effect by cell signaling. Such signals can be hormones or neurotransmitters and may be initiated by changes in mood, temperature, stress, or visible changes in local environment. It was not until the 1960s that the structure and coloration of chromatophores were understood well enough to allow the development of a system of sub-classification based on their appearance. This classification system persists to this day even though more recent studies have revealed that certain biochemical aspects of the pigments may be more useful to a scientific understanding of how the cells function (Bagnara 1966). Color-production falls into distinct classes: Biochromes and schemochromes (Fox 1976). The biochromes include true pigments, such as carotenoids and pteridines. These pigments selectively absorb parts of the visible light spectrum that makes up white light while permitting other wavelengths to reach the eye of the observer. Schemochromes, also known as "structural colors," produce coloration by reflecting some wavelengths (colors) of light and transmitting others, by causing light waves to interfere within the structure or by scattering light which falls upon them. While all chromatophores contain pigments or reflecting structures (except when there has been a genetic mutation resulting in a disorder like albinism), not all pigment-containing cells are chromatophores. Haem, for example, is a biochrome responsible for the red appearance of blood. It is primarily found in red blood cells (erythrocytes), which are generated in bone marrow throughout the life of an organism, rather than being formed during embryological development. Therefore, erythrocytes are not classified as chromatophores. A veiled chameleon, Chamaeleo calyptratus. Structural green and blue colors are generated by overlaying chromatophore types to reflect filtered light. Chromatophores that contain large amounts of yellow pteridine pigments are named xanthophores and those with an excess of red/orange carotenoids termed erythrophores (Bagnara 1966). It was discovered that pteridine and carotenoid containing vesicles are sometimes found within the same cell, and that the overall color depends on the ratio of red and yellow pigments (Matsumoto 1965). Therefore, the distinction between these chromatophore types is essentially arbitrary. The capacity to generate pteridines from guanosine triphosphate is a feature common to most chromatophores, but xanthophores appear to have supplemental biochemical pathways that result in an excess accumulation of yellow pigment. In contrast, carotenoids are metabolised from the diet and transported to erythrophores. This was first demonstrated by rearing normally green frogs on a diet of carotene-restricted crickets. The absence of carotene in the frog's diet meant the red/orange carotenoid color "filter" was not present in erythrophores. This resulted in the frog appearing blue in color, instead of green (Bagnara 1998). Iridophores, sometimes also called guanophores, are pigment cells that reflect light using plates of crystalline chemochromes made from guanine (Taylor 1969). When illuminated they generate iridescent colors because of the diffraction of light within the stacked plates. Orientation of the schemochrome determines the nature of the color observed (Morrison 1995). By using biochromes as colored filters, iridophores create an optical effect known as Tyndall or Rayleigh scattering, producing bright blue or green colors (Fujii 2000). A related type of chromatophore, the leucophore, is found in some fish, particularly in the tapetum lucidum. Like iridophores, they utilize crystalline purines (often guanine) to reflect light. Unlike iridophores, however, leucophores have more organized crystals, which reduce diffraction. Given a source of white light, they produce a white shine. 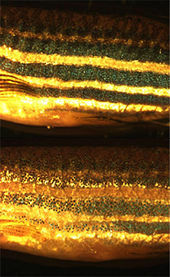 As with xanthophores and erythrophores, in fish the distinction between iridophores and leucophores is not always obvious, but generally iridophores are considered to generate iridescent or metallic colors while leucophores produce reflective white hues (Fujii 2000). A mutant zebrafish larva that fails to synthesise melanin in its melanophores, beneath a non-mutant, wildtype larva. Melanophores contain eumelanin, a type of melanin, that appears black or dark brown because of its light absorbing qualities. It is packaged in vesicles called melanosomes and distributed throughout the cell. Eumelanin is generated from tyrosine in a series of catalysed chemical reactions. It is a complex chemical containing units of dihydroxyindole and dihydroxyindole-2-carboxylic acid with some pyrrole rings (Ito and Wakamatsu 2003). The key enzyme in melanin synthesis is tyrosinase. When this protein is defective, no melanin can be generated, resulting in certain types of albinism. In some amphibian species, there are other pigments packaged alongside eumelanin. For example, a novel deep red colored pigment was identified in the melanophores of phyllomedusine frogs (Bagnara et al. 1973). This was subsequently identified as pterorhodin, a pteridine dimer that accumulates around eumelanin. While it is likely that other, lesser studied species have complex melanophore pigments, it is nevertheless true that the majority of melanophores studied to date do contain eumelanin exclusively. Humans have only one class of pigment cell, the mammalian equivalent of melanophores, to generate skin, hair, and eye color. For this reason, and because the large number and contrasting color of the cells usually make them very easy to visualize, melanophores are by far the most widely studied chromatophore. However, there are differences between the biology of melanophores and melanocytes. In addition to eumelanin, melanocytes can generate a yellow/red pigment called phaeomelanin. Dendrobates pumilio, a poison dart frog. Some brightly colored species have unusual chromatophores of unknown pigment composition. In 1995, it was demonstrated that the vibrant blue colors in some types of mandarin fish are not generated by schemochromes. Instead, a cyan biochrome of unknown chemical nature is responsible (Fujii 2000). This pigment, found within vesicles in at least two species of callionymid fish, is highly unusual in the animal kingdom, as all other blue colorings thus far investigated are schemochromatic. Therefore, a novel chromatophore type, the cyanophore, was proposed. Although they appear unusual in their taxonomic restriction, there may be cyanophores (as well as further unusual chromatophore types) in other fish and amphibians. For example, bright colored chromatophores with undefined pigments have been observed in both poison dart frogs and glass frogs (Schwalm et al. 1977). During vertebrate embryonic development, chromatophores are one of a number of cell types generated in the neural crest, a paired strip of cells arising at the margins of the neural tube. These cells have the ability to migrate long distances, allowing chromatophores to populate many organs of the body, including the skin, eye, ear, and brain. 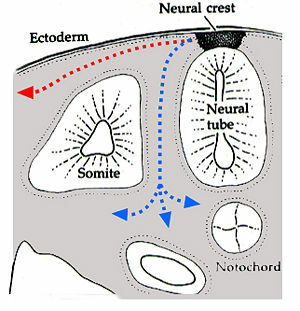 Leaving the neural crest in waves, chromatophores take either a dorsolateral route through the dermis, entering the ectoderm through small holes in the basal lamina, or a ventromedial route between the somites and the neural tube. The exception to this is the melanophores of the retinal pigmented epithelium of the eye. These are not derived from the neural crest, instead an outpouching of the neural tube generates the optic cup which, in turn, forms the retina. When and how multipotent chromatophore precursor cells (called chromatoblasts) develop into their daughter subtypes is an area of ongoing research. It is known in zebrafish embryos, for example, that by 3 days after fertilization each of the cell classes found in the adult fish—melanophores, xanthophores, and iridophores—are already present. Studies using mutant fish have demonstrated that transcription factors such as kit, sox10, and mitf are important in controlling chromatophore differentiation (Kelsh et al. 2000). If these proteins are defective, chromatophores may be regionally or entirely absent, resulting in a leucistic disorder. Many species have the ability to translocate the pigment inside chromatophores, resulting in an apparent change in color. This process, known as physiological color change, is most widely studied in melanophores, since melanin is the darkest and most visible pigment. In most species with a relatively thin dermis, the dermal melanophores tend to be flat and cover a large surface area. However, in animals with thick dermal layers, such as adult reptiles, dermal melanophores often form three-dimensional units with other chromatophores. These dermal chromatophore units (DCU) consist of an uppermost xanthophore or erythrophore layer, then an iridophore layer, and finally a basket-like melanophore layer with processes covering the iridophores (Bagnara et al. 1968). Both types of dermal melanophores are important in physiological color change. Flat dermal melanophores will often overlay other chromatophores so when the pigment is dispersed throughout the cell the skin appears dark. When the pigment is aggregated towards the center of the cell, the pigments in other chromatophores are exposed to light and the skin takes on their hue. Similarly, after melanin aggregation in DCUs, the skin appears green through xanthophore (yellow) filtering of scattered light from the iridophore layer. On the dispersion of melanin, the light is no longer scattered and the skin appears dark. As the other biochromatic chomatophores are also capable of pigment translocation, animals with multiple chromatophore types can generate a spectacular array of skin colors by making good use of the divisional effect (Palazzo et al. 1989; Porras et al. 2003). A single zebrafish melanophore imaged by time-lapse photography during pigment aggregation. The control and mechanics of rapid pigment translocation has been well studied in a number of different species, particularly amphibians and teleost fish (Deacon et al. 2003; Fujii 2000). It has been demonstrated that the process can be under hormonal control, neuronal control, or both. Neurochemicals that are known to translocate pigment include noradrenaline, through its receptor on the surface on melanophores (Aspengren et al. 2003). The primary hormones involved in regulating translocation appear to be the melanocortins, melatonin, and melanin concentrating hormone (MCH), which are produced mainly in the pituitary, pineal gland, and hypothalamus, respectively. These hormones may also be generated in a paracrine fashion by cells in the skin. At the surface of the melanophore, the hormones have been shown to activate specific G-protein coupled receptors, which in turn transduce the signal into the cell. Melanocortins result in the dispersion of pigment, while melatonin and MCH results in aggregation (Logan et al. 2006). Numerous melanocortin, MCH, and melatonin receptors have been identified in fish (Logan et al. 2003a) and frogs (Sugden et al. 2004), including a homologue of MC1R (Logan et al. 2003b), a melanocortin receptor known to regulate skin and hair color in humans (Valverde et al. 1995). Inside the cell, cyclic adenosine monophosphate (cAMP) has been shown to be an important second messenger of pigment translocation. Through a mechanism not yet fully understood, cAMP influences other proteins such as protein kinase A to drive molecular motors carrying pigment containing vesicles along both microtubules and microfilaments (Snider et al. 2004; Rodionov et al. 1998; Kashina et al. 2004). Most fish, reptiles, and amphibians undergo a limited physiological color change in response to a change in environment. This type of camouflage, known as background adaptation,', most commonly appears as a slight darkening or lightening of skin tone to approximately mimic the hue of the immediate environment. It has been demonstrated that the background adaptation process is vision dependent (it appears the animal needs to be able to see the environment to adapt to it) (Neuhauss 2003), and that melanin translocation in melanophores is the major factor in color change (Logan et al. 2006). 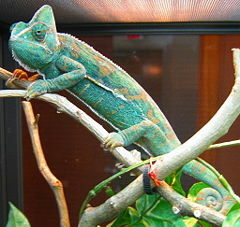 Some animals, such as chameleons and anoles, have a highly developed background adaptation response capable of generating a number of different colors very rapidly. They have adapted the capability to change color in response to temperature, mood, stress levels, and social cues, rather than to simply mimic their environment. Transverse section of a developing vertebrate trunk showing the dorsolateral (red) and ventromedial (blue) routes of chromatoblast migration. Coleoid cephalopods have complex multicellular "organs" that they use to change color rapidly. This is most notable in brightly colored squid, cuttlefish, and octopuses. Each chromatophore unit is composed of a single chromatophore cell and numerous muscle, nerve, sheath, and glial cells (Cloney and Florey 1968). Inside the chromatophore cell, pigment granules are enclosed in an elastic sac, called the cytoelastic sacculus. To change color, the animal distorts the sacculus form or size by muscular contraction, changing its translucency, reflectivity, or opacity. This differs from the mechanism used in fish, amphibians, and reptiles, in that the shape of the sacculus is being changed rather than a translocation of pigment vesicles within the cell. However, a similar effect is achieved. Octopuses operate chromatophores in complex, wavelike chromatic displays, resulting in a variety of rapidly changing color schemes. The nerves that operate the chromatophores are thought to be positioned in the brain, in a similar order to the chromatophores they each control. This means the pattern of color change matches the pattern of neuronal activation. This may explain why, as the neurons are activated one after another, the color change occurs in waves (Demski 1992). Like chameleons, cephalopods use physiological color change for social interaction. They are also among the most skilled at background adaptation, having the ability to match the color, pattern, intensity, and the texture of their local environment with remarkable accuracy. Chromatophores are also found in membranes of phototrophic bacteria. Used primarily for photosynthesis, they contain bacteriochlorophyll pigments and carotenoids (Salton 1987). In purple bacteria, such as Rhodospirillum rubrum, the light-harvesting proteins are intrinsic to the chromatophore membranes. However, in green sulfur bacteria, they are arranged in specialized antenna complexes called chlorosomes (Frigaard and Bryant 2004). In addition to basic research into better understanding of chromatophores themselves, the cells are used for applied research purposes. For example, zebrafish larvae are used to study how chromatophores organize and communicate to accurately generate the regular horizontal striped pattern as seen in adult fish (Kelsh 2004). This is seen as a useful model system for understanding patterning in the evolutionary developmental biology field. Chromatophore biology has also been used to model human condition or disease, including melanoma and albinism. Recently the gene responsible for the melanophore-specific golden zebrafish strain, Slc24a5, was shown to have a human equivalent that strongly correlates with skin color (Lamason et al. 2005). Chromatophores are also used as a biomarker of blindness in cold-blooded species, as animals with certain visual defects fail to background adapt to light environments (Neuhauss 2003). Human homologues of receptors that mediate pigment translocation in melanophores are thought to be involved in processes such as appetite suppression and tanning, making them attractive targets for drugs (Logan et al. 2003b). Therefore pharmaceutical companies have developed a biological assay for rapidly identifying potential bioactive compounds using melanophores from the African clawed frog (Jayawickreme et al. 1999). Other scientists have developed techniques for using melanophores as biosensors (Andersson et al. 2005), and for rapid disease detection (based on the discovery that pertussis toxin blocks pigment aggregation in fish melanophores) (Karlsson et al. 1991). 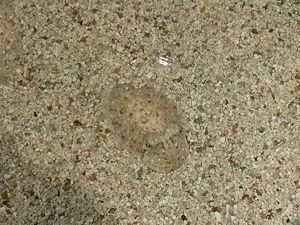 Potential military applications of chromatophore mediated color changes have been proposed, mainly as a type of active camouflage (Lee 2005). Andersson, T.P., D. Filippini, A. Suska, et al. 2005. Frog melanophores cultured on fluorescent microbeads: Biomimic-based biosensing. Biosens Bioelectron 21: 111-120. PMID 15967358. Retrieved August 6, 2008. Aspengren, S.H.N. Sköld, G. Quiroga, L. Mårtensson, and M. Wallin. 2003. Noradrenaline- and melatonin-mediated regulation of pigment aggregation in fish melanophores. Pigment Cell Res 16: 59–64. PMID 12519126. Retrieved August 6, 2008. Bagnara, J.T. 1966. Cytology and cytophysiology of non-melanophore pigment cells. Int Rev Cytol 20: 173–205. PMID 5337298. Retrieved August 6, 2008. Bagnara, J.T. 1998. Comparative Anatomy and Physiology of Pigment Cells in Nonmammalian Tissues in The Pigmentary System: Physiology and Pathophysiology. Oxford University Press. ISBN 0195098617. Bagnara, J.T., J.D. Taylor, and M.E. Hadley. 1968. The dermal chromatophore unit. J Cell Biol 38: 67–79. PMID 5691979. Retrieved August 6, 2008. Bagnara, J.T., J.D. Taylor, and G. Prota. 1973. Color changes, unusual melanosomes, and a new pigment from leaf frogs. Science 182: 1034–5. PMID 4748673. Retrieved August 6, 2008. Cloney, R.A., and E. Florey. 1968. Ultrastructure of cephalopod chromatophore organs. Z Zellforsch Mikrosk Anat 89: 250–280. PMID 5700268. Retrieved August 6, 2008. Deacon, S.W., 2003. Dynactin is required for bidirectional organelle transport. J Cell Biol 160: 297-301. PMID 12551954. Retrieved August 6, 2008. Demski, L.S. 1992. Chromatophore systems in teleosts and cephalopods: A levels oriented analysis of convergent systems. Brain Behav Evol 40:141-56. PMID 1422807. Retrieved August 6, 2008. Fox, D.L. 1976. Animal Biochromes and Structural Colors: Physical, Chemical, Distributional and Physiological Features of Colored Bodies in the Animal World. Berkeley: University of California Press. ISBN 0520023471. Frigaard, N.U., and D.A. Bryant. 2004. Seeing green bacteria in a new light: Genomics-enabled studies of the photosynthetic apparatus in green sulfur bacteria and filamentous anoxygenic phototrophic bacteria. Arch Microbiol 182: 265-75. PMID 15340781. Retrieved August 6, 2008. Fujii, R. 2000. The regulation of motile activity in fish chromatophores. Pigment Cell Res. 13: 300-19. PMID 11041206. Ito, S., and K. Wakamatsu. 2003. Quantitative analysis of eumelanin and pheomelanin in humans, mice, and other animals: A comparative review. Pigment Cell Res 16: 523-31. PMID 12950732. Retrieved August 6, 2008. Jayawickreme, C.K., H. Sauls, N. Bolio, et al. 1999. Use of a cell-based, lawn format assay to rapidly screen a 442,368 bead-based peptide library. J Pharmacol Toxicol Methods 42: 189-97. PMID 11033434. Retrieved August 6, 2008. Karlsson, J.O., R.G. Andersson, P. Askelöf, et al. 1991. The melanophore aggregating response of isolated fish scales: A very rapid and sensitive diagnosis of whooping cough. FEMS Microbiol Lett 66: 169-75. PMID 1936946. Retrieved August 6, 2008. Kashina, A.S., I.V. Semenova, P.A. Ivanov, et al. 2004. Protein kinase A, which regulates intracellular transport, forms complexes with molecular motors on organelles. Curr Biol 14:1877–81. PMID 15498498. Retrieved August 6, 2008. Kelsh, R.N., B. Schmid, and J.S. Eisen. 2000. Genetic analysis of melanophore development in zebrafish embryos. Dev Biol 225: 277-93. PMID 10985850. Retrieved August 6, 2008. Kelsh, R.N. 2004. Genetics and evolution of pigment patterns in fish. Pigment Cell Res 17: 326-36. PMID 15250934. Retrieved August 6, 2008. Lamason, R.L., M.A. Mohideen, J.R. Mest, et al. 2005. SLC24A5, a putative cation exchanger, affects pigmentation in zebrafish and humans. Science 310: 1782–6. PMID 16357253. Retrieved August 6, 2008. Lee, I. 2005. Nanotubes for Noisy Signal Processing: Adaptive Camouflage. PhD Thesis, University of Southern California. Retrieved August 6, 2008. Logan, D.W., R.J. Bryson-Richardson, M.S. Taylor, et al. 2003a. Sequence characterization of teleost fish melanocortin receptors. Ann N Y Acad Sci 994: 319-30. PMID 12851332. Retrieved August 6, 2008. Logan, D.W., R.J. Bryson-Richardson, K.E. Pagán, et al. 2003b. The structure and evolution of the melanocortin and MCH receptors in fish and mammals. Genomics 81: 184-91. PMID 12620396. Retrieved August 6, 2008. Logan, D.W., S.F. Burn, and I.J. Jackson. 2006. Regulation of pigmentation in zebrafish melanophores. Pigment Cell Res 19: 206-13. PMID 16704454. Retrieved August 6, 2008. Matsumoto, J. 1965. Studies on fine structure and cytochemical properties of erythrophores in swordtail, Xiphophorus helleri. J Cell Biol 27: 493–504. PMID 5885426. Retrieved August 6, 2008. Morrison, R.L. 1995. A transmission electron microscopic (TEM) method for determining structural colors reflected by lizard iridophores. Pigment Cell Res 8: 28–36. PMID 7792252. Retrieved August 6, 2008. Neuhauss, S.C. 2003. Behavioral genetic approaches to visual system development and function in zebrafish. J Neurobiol 54: 148-60. PMID 12486702. Retrieved August 6, 2008. Palazzo, R.E., T.J. Lynch, S.J. Lo, J.D. Taylor, and T.T. Tchen. 1989. Rearrangements of pterinosomes and cytoskeleton accompanying pigment dispersion in goldfish xanthophores. Cell Motil Cytoskeleton 13:9–20. PMID 2543509. Retrieved August 6, 2008. Porras, M.G., A. De Loof, M. Breuer, and H. Aréchiga. 2003. Corazonin promotes tegumentary pigment migration in the crayfish Procambarus clarkii. Peptides 24: 1581–9. PMID 14706537. Retrieved August 6, 2008. Rodionov, V.I., A.J. Hope, T.M. Svitkina, and G.G. Borisy. 1998. 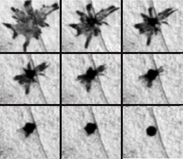 Functional coordination of microtubule-based and actin-based motility in melanophores. Curr Biol 8: 165-8. PMID 9443917. Retrieved August 6, 2008. Salton, M.R. 1987. Bacterial membrane proteins. Microbiol Sci 4: 100-5. PMID 3153178. Retrieved August 6, 2008. Sangiovanni, G. 1819. Descrizione di un particolare sistema di organi cromoforo espansivo-dermoideo e dei fenomeni che esso produce, scoperto nei molluschi cefaloso. G. Enciclopedico Napoli 9:1–13. Schwalm, P.A., P.H. Starrett, and R.W. McDiarmid. 1977. Infrared reflectance in leaf-sitting neotropical frogs. Science 196: 1225–7. PMID 860137. Retrieved August 6, 2008. Snider, J., F. Lin, N. Zahedi, et al. 2004. Intracellular actin-based transport: how far you go depends on how often you switch. Proc Natl Acad Sci USA 101: 13204-9. PMID 15331778. Retrieved August 6, 2008. Sugden, D., K. Davidson, K.A. Hough, and M.T. Teh. 2004. Melatonin, melatonin receptors and melanophores: A moving story. Pigment Cell Res 17: 454-60. PMID 15357831. Retrieved August 6, 2008. Taylor, J.D. 1969. The effects of intermedin on the ultrastructure of amphibian iridophores. Gen Comp Endocrinol 12: 405-16. PMID 5769930. Retrieved August 6, 2008. Valverde, P., E. Healy, I. Jackson, J.L. Rees, and A.J. Thody. 1995. Variants of the melanocyte-stimulating hormone receptor gene are associated with red hair and fair skin in humans. Nat Genet 11: 328-30. PMID 7581459. Retrieved August 6, 2008. This page was last modified on 13 August 2008, at 16:50.